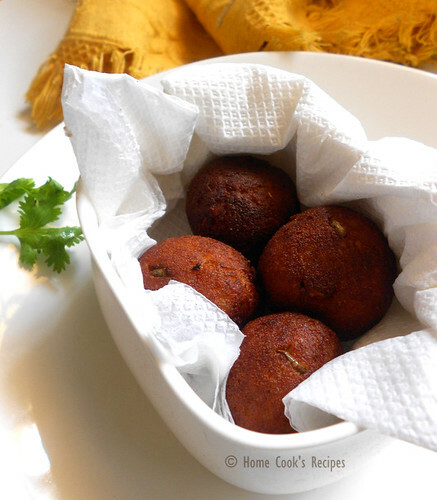 I dont like to fry paneer, but frying paneer for this kofta was excused when i tasted it. Its one of the richest deepfry. i referred many sites, but combined the recipe from sia's Malai Kofta and from ecurry. Pressure Cook the Potatoes upto 4 or 5 whistles. peel the skin of the potatoes and mash them. Grate the Paneer very finely. also chop the Green chilli's finely. In a Large Bowl, Add the mashed Potatoes, Grated Paneer, finely chopped Green Chilli's and chopped corriander leaves & mix well. Add salt to taste, Garam masala, Bread Crumbs, Milk Powder and Corn Flour and mix well. Knead them all together. knead, as we do our chapathi dough. Shape them into small balls. Make a dent on the kofta ball's, stuff it with one cashew bit and 2 dry grapes. likewise stuff all the kofta balls. Each Kofta ball should be of a medium lemon size. Remove the Kofta's to a tissue paper and then serve. 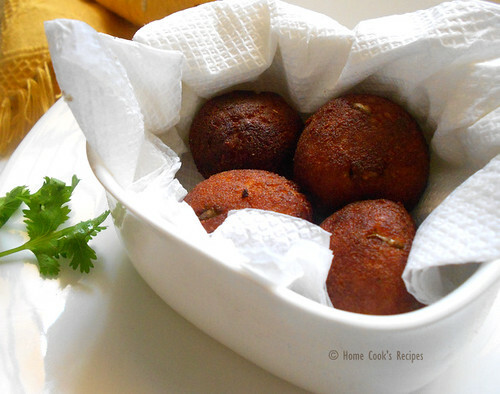 Serve with ketchup or use the kofta's in biryani or in Malai Kofta. So you can guess what my next post is going to be. You can also add a drop of fresh cream and then cashew bits and dry grapes for stuffing. Bread Crumbs, corn flour and milk powder all act together as binding agent. Bread Crumbs or Corn flour is a must for these kofta's. If you dont have bread crumbs, toast 2 bread slices. trim its edges and cut the bread into pieces. grind the bread pieces in mixie to get bread crumbs. Sounds like a super-indulgent kofta.. so good..
love this kofta. i make it almost in similar manner but dont add milk powder. thats a good idea to have soft and creamy texture. i love this kofta my recipe is also same but i use only corn flour. Very interesting one. Nice recipe. YUM!!! Lovely looking koftas. Already drooling over here. milk powder thats a very new addition .. wow perfectly awesome..
Never say no to koftas that too with paneer, simply inviting..
very nice and yummy version of kofta. looks very neat and perfect too.